Empathy In Psychopaths: A Neurological Basis? Psychopathy is a personality disorder characterized by a lack of empathy and remorse, shallow affect, glibness, manipulation and callousness. Though less than one percent of the general population meet the criteria, the rate of psychopathy in prisons is around 23%. As you might suspect, psychopaths don't much care when people are in pain. A new paper using functional magnetic resonance imaging (fMRI) on the brains of 121 inmates of a medium-security prison in the USA finds that in psychopaths, the brain areas necessary for feeling empathy and concern for others fail to become active and be connected to other important regions involved in affective processing and decision-making. 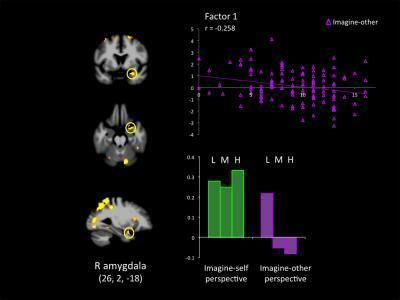 Response in the right amygdala across groups of low (L), medium (M) and high (H) psychopathy participants, when they adopted an imagine-self and an imagine-other affective perspective while viewing bodily injuries. Groupwise effects (bars at the bottom of the figure) are expanded to show the contribution of continuous PCL-R subscores on factor 1, which encompasses the emotional/interpersonal features of psychopathy.Credit: Decety. J, Chenyi. C, Harenski. C, and Kiehl. K, A. Frontiers in Human Neuroscience, 2013.